The MPDSnC driver, based on DDS (Direct Digital Synthesizer), has been specially designed in order to exploit the best of the AOTFnC features. 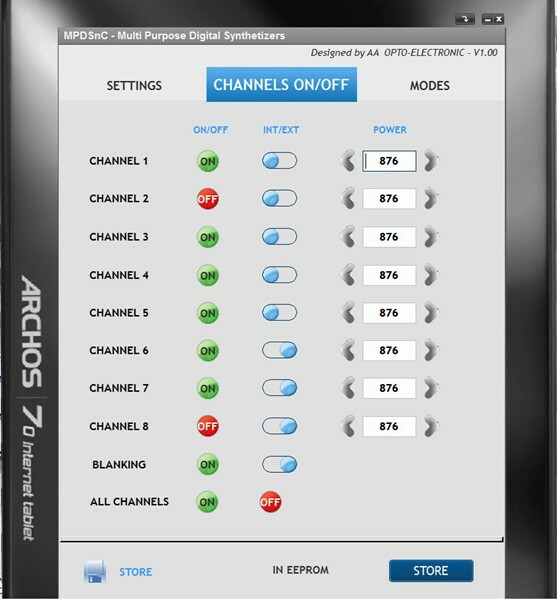 It offers up to 8 single channels mixed in one output. Its compact design with single power supply, low RF emissions and ease of use will satisfy the most demanding of applications, where accuracy and flexibility are key requirements. Thanks to its complete digital design and integrated microcontroller setting up is fast, simple and repeatable. Access to and adjustments of functions is simple with either an Android tablet (with remote control adjustment) or through a RS232 serial link (with computer control) or USB communication. All parameters are stored in an EEPROM and are automatically loaded after each switch on. Each line is externally controlled by a distinct modulation input signal which can be digital or analog. Additionally, all lines can be simultaneously controlled by a blanking signal which produces smooth effects without modifying the colorimetric balance. The combination of the modulation input and blanking signals provides the best extinction ratio performance (> 100 dB).